New Condition With Missing Diamante Defect. Size - UK 6 - EUR 39 - Standard Fit. Colour - Black. Wedge Heel - 3" 7.5 cm Approx. Strap slide sandal with Goga Max® footbed and Skechers GOrun 600 design sole. ON-THE-GO 600-MONARCH Taupe Casual Sandals. Soft heathered and floral print jersey knit fabric in a sporty casual comfort cross. Lovely pair of Skechers Cali Dark Brown Sandals size 5. Cushioned insoles for comfort and 3 1/2" heels. In really good used condition. Women's Skechers ON-THE-GO MONARCH Taupe Casual Sandals, Size UK 6 WORN ONCE!! Women's Skechers ON-THE-GO 600-MONARCH 15306/TPE Taupe Casual Sandals, Size UK 6. WORN ONLY ONCE!! (I should have got the smaller size!) Gogamax soles, lovely and squishy. SKECHERS SANDALS. Espadrille/rope trim cork wedge heels - approx 4" high. UK 8 (28.5cm from toe to heel and 10cm across widest part of foot). Skechers Black Woven Memory Foam Wedge Sandals Size 6 Uk. 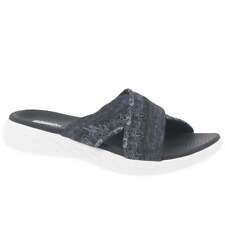 Extremely comfortable slip on memory foam sandals from Skechers. Black woven stretchy textile upper with fixed strap to front and peep toe. Memory foam footbed. Wedge heel, approx 6.5cm with approx 3cm platform sole. Inside rear left heel suggests size 9 but definitely is UK6. barely worn so in very good condition. Ideal for summer and holidays. From pet free smoke free home Condition is Used. Dispatched with Royal Mail 2nd Class.